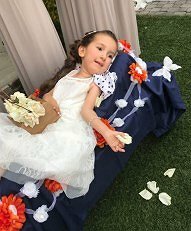 My name is Aubrey Paige Ibrahim and I am 4 years old which some may consider a miracle. I was given until the age of 2 to survive, but I have already beaten those odds! I was born on May 31, 2013. Around 4 months of age my mom noticed I was getting weaker instead of stronger. I kept getting sick and going to the doctors every other day for over a month. In December of 2013, I got really sick with a respiratory virus and had to be hospitalized. It was then that I was diagnosed with SMA Type-1. Spinal Muscular Atrophy (SMA) is a genetic disease affecting the part of the nervous system that controls voluntary muscle movement. It takes away my ability to walk, eat, and even breathe. SMA is the number one killer of babies and children and is quite common. There is currently no cure. I have been in and out of hospitals all my life. I’m under the care of a great team of physicians who look after me and a nurse comes to my house every day for 8-12 hours to help my mommy take care of me. She needs to use many pieces of medical equipment daily to help keep me alive. A nebulizer treatment is required every morning and night with chest physical therapy followed by several sets of a cough assist and suctioning. The cough assist is a machine that forces me to cough anything out in my chest since I’m too weak to cough on my own. It also is to prevent any build up in my lungs which has caused multiple lung collapses and days, sometimes months, in the hospital. I need someone near me 24 hours a day to make sure I am breathing ok. There are many other costly items such as my LT ventilator that I use to ensure my lungs are getting proper airflow. A special wheelchair allows me to lie semi-flat as my muscles are too weak for me to sit up. When I do try to sit up I have to wear a special torso brace to help keep my back straight. I am working on it every day. Eating orally stopped after my hospitalization in 2014 so I now get fed via a G-Tube, which is connected directly to my tummy. The purchase of a specially modified van was needed to transport me, and a ramp was built to get me in the house. My mom had to quit her job to care for me and to take me to my therapies 4 times a week which include an occupational therapist to help me work on fine-motor skills; a physical therapist to help me improve movement and keep my muscles active; and a speech therapist who works with me in talking and pronunciation. The therapy is hard and tires me out. My dad works full time to provide for us and pay for all my medical bills. Even with insurance, my therapies and equipment are not fully covered, and it can get very expensive. It’s tough for my parents and there are more expenses to come. I will need a special bathtub and, as I grow, a new wheelchair. Hopefully one day, my bedroom can be moved to the first floor, so my parents won’t have to carry me up and down the stairs throughout the day. All of this adds up to a financial challenge we cannot face alone. Your help can make the difference! To help with this financial burden of the uninsured expenses, a fundraising campaign has been established in my honor with Help Hope Live, a trusted nonprofit organization that has been providing community-based fundraising guidance to help patients and families in need for more than 30 years. All donations are tax-deductible to the full extent allowed by law and are held by Help Hope Live in the Mid-Atlantic Catastrophic Illness Fund in honor of Aubrey Ibrahim. Donations are allocated by Help Hope Live based on financial need for medical expenses. Please consider making a donation today. 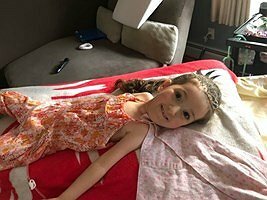 Despite all my medical and physical challenges, I am a normal 4-year-old girl who enjoys so many things this life has to offer. I go to preschool with the assistance of my nurse and mom and Skype in during cold and flu season, so I don’t catch any germs that will make me very sick. I enjoy arts and crafts, my dollhouse, my iPad, playing with my puppy, and visiting the zoo when the weather and my health permit it! I’m enjoying life and living every moment! So many people love me and care about my well being. I am very blessed to have each of them in my life.